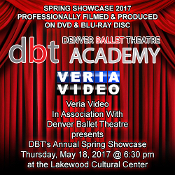 Veria Video In Association With Denver Ballet Theater Academy presents the studio's Spring Showcase production held on Thursday May 18, 2017, 6:30PM at the Lakewood Cultural Center in Lakewood, CO. Professionally filmed in High Definition and available on both Standard Definition DVD & High Definition Blu-ray Disc. All orders will be delivered to the dance studio when finished for pickup unless you select the “Mail it to me!” shipping option ($5) during checkout, upon which we will ship your order to your provided address. Estimate time of completion / delivery is 6 weeks after filming of event. Digital Copy (if ordered) will be sent via e-mail notification for download when videos are finsihed as well.